The bar is a prominent feature at Furlough: it’s the first thing you see at the entrance, whomever’s at the bar will likely be the first to greet you warmly, and the array of bottles (including house made bitters and syrups) on display will peak interest. Cocktail aficionados know of the restaurant as a place to get tasty liberations - don’t be surprised to see guests coming in after 9pm on weeknights for a night cap. 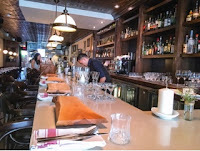 After all, when a drink menu is bound and wrapped in leather (compared to printed note cards used for food), you get a sense of what the restaurant specializes in – although to be fair the food was fantastic. In light of this, having a cocktail to start and end the meal, at least, is ideal. 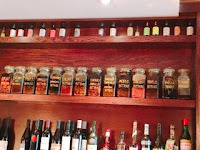 Although Furlough concocts a lot of the classics (Sazerac, Moscow Mules), there’s some interesting contemporary offerings that you won’t find elsewhere. Just imagine what they could be by the names: Tibetan Peach Pie, Monet, and Ask Me Tomorrow… getting interested yet? Having had numerous French 75s ($14), I finally learnt the name doesn’t have any romantic wistful cogitations to the olden days of Paris; rather is named after the French 75mm gun on account of the kick from the absinthe incorporated in the original recipe! This compared to the cocktail we know today as refreshing gin shaken with simple syrup and lemon juice, then strained into a champagne flute and topped with sparkling wine. It’s hard to imagine such an easy going drink once being deadly. A favourite of the table was the Last Word ($14), a concoction that seems strong as it enters the mouth but transforms into an utterly smooth finish; the herbal Chartreuse sneaks in first but everything’s mellowed out by the Maraschino liqueur and lime juice. To end, an aptly named drink: the Happily Ever After, best described by my friend as “birthday cake in a cup”. 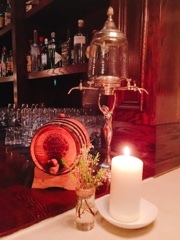 The gin is infused with strawberries to give the liquor a vivid red colour and berry notes. Shaken twice, first with the egg whites and then with the other ingredients (pineapple syrup, vanilla syrup, Pinot and aperol), the resulting gin sour is silky smooth with the foam adding a frosting quality to the sweet cocktail. 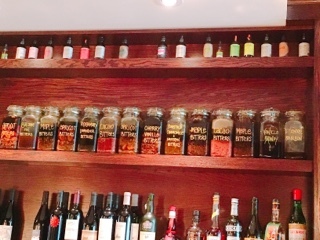 Furlough builds their cocktails by using a variety of house-made bitters, syrups and infused spirits. In this end, it’s balancing the bitters and the sweets you get a boozy drink without it tasting like one. 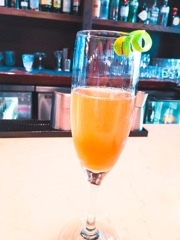 The Basil and Elderflower Fizz ($14) is the perfect hot weather sipping drink. 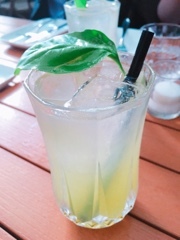 Refreshing muddled basil and vanilla is mixed with cooling cucumber, gin, elderflower liqueur and lime. Since it’s topped with sparkling water, it’s also a cocktail that helps quench your thirst. If the cocktails on the menu doesn’t catch your eye, feel free to sit at the bar and throw out ideas. Wanting something with their delicious strawberry gin again, but also the bubbles of the sparkling wine, I concocted the Strawbasil Fields Forever ($14) (thanks to my friend J for the fitting name). Similar to the French 75, the strawberry gin is shaken with ice along with rosemary syrup and muddled basil, then strained into a flute and topped with sparkling wine. It’s exactly what I was craving and a little bird told me that you can order it as an off menu item. Throughout the process I was marveled by how much passion Gabriel Quigley exuded: a history professor when recounting about the origins of a cocktail or even bringing a scientific angle to the drinks while explaining why some have to be shaken vs. stirred (turns out James Bond has it all wrong). 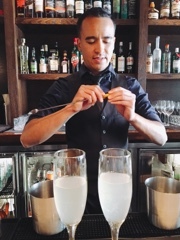 In the end, a mixologist is not unlike a sommelier: you need to know about the drink’s origins and how its properties will work with whatever it’ll be consumed alongside. 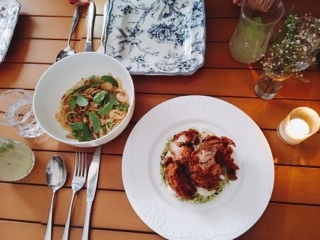 As much as I love a good drink, food is what wins my heart (the French bistro inspired dishes made by Chef Thomas O’Neill certainly had me swooning). 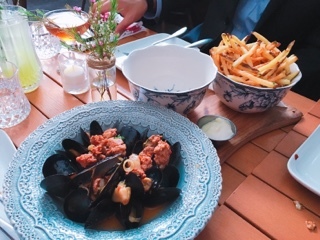 Starting with the classic moules and frites ($15), the mussels fresh and swimming in a fantastic leek and confit garlic broth with pieces of chorizo on top for added flavours and spice. The shoestring fries were deliciously hot and crispy; the perfect vessel for dipping into the broth and sharing. In fact, Furlough has a selection of starters that are great for sharing. 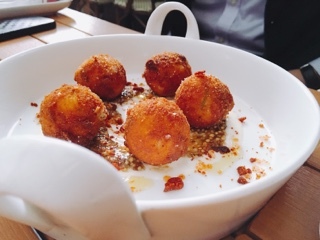 Arriving with a heavenly scent, the ham hock croquettes ($9) are deep fried nuggets of hot mashed potato laced with pieces of pork. Sitting on the plate are a selection of condiments including a beer mayo and ramp mustard, but it’s the crunchy pieces of salted chicharron (pork rind) that made the dish. 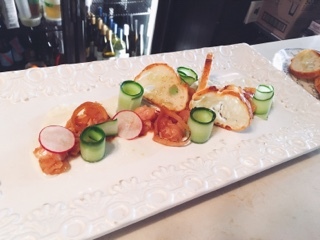 Thankfully, there were plenty of crostini (on the plate and as a side) accompanying the Albacore tuna tartar ($15). The meaty diced pieces of fish were tossed with sesame oil to give off a fragrant aroma and all the crisp vegetables (radish, cucumber and pickled shallots) lightened the dish, a great choice for the warmer months. 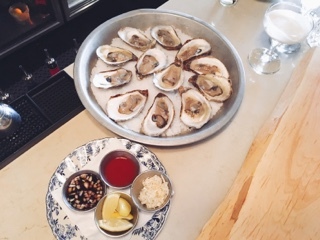 Of course, Furlough also offers the sharing crowd favourites: freshly shucked oysters, that evening a dozen Mallet St. Simon ($42 for a dozen) served with a lovely mignonette, shaved horseradish and cocktail sauce (these go particularly well with the French 75), as well as a charcuterie board ($19) featuring a selection of delicious meats made in-house (a meaty chorizo, flavourful and rich mortadella, and salty Genoa salami) and cheeses (aged gruyere and stilton). Mixed throughout the board are toasted bread, a thick fig jam, lovely pickled beets and gherkins. The house-made bread even makes its way into their mains - the brioche chitarra ($19) incorporates the bread crumbs into the buttery topping. 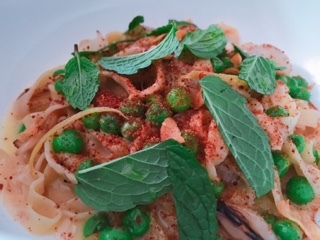 This pasta oozes the taste of spring with peas, sweet cipollini onions and bright mint. Touches of cream ties everything together into a hearty main. Of all the meat-based larger plates, the duck confit ($28) was the only slip as the fowl was extremely salty. 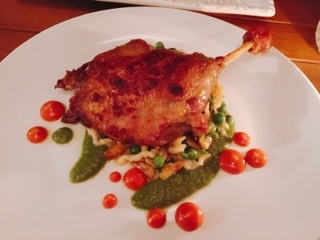 Nonetheless, the duck was cooked perfectly with a crispy well-rendered skin and moist interior and the dish was salvageable by mixing slivers of the duck into the citrusy spaetzle, which helped mellow out the saltiness. 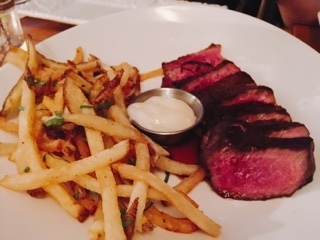 The striploin in the steak frites ($29) was also well prepared arriving spot on medium rare and having a lovely sear. Although the meat was good, we were all just excited to see more of Furlough’s fantastic fries … a bowl of these with cocktails could satisfy me any day. 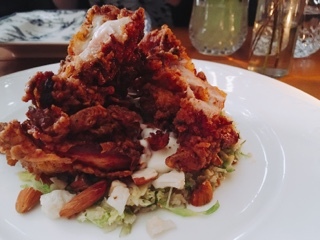 What will have me returning for more is their fried chicken ($21) … it’s not French but oh so fantastic! Having been brined twice (soaked in liquid for flavour and then buttermilk for further moisture) the chicken is juicy and flavourful. The crust has enough coating for crunch but not too much to be overwhelming. Even the baby cabbage coleslaw on the bottom is jazzed up with pickled cauliflower and almond. There not a thing I’d change about the dish … except maybe include some of the Furlough fries on the side. For dessert we shared a combination dessert of their Curds & Cookies with a Deconstructed Black Forest cake. 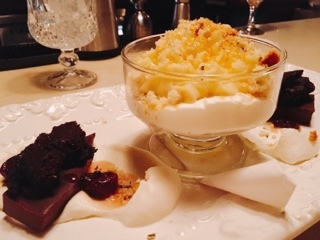 The bowl of curds is reminiscent of the British Eton Mess: plenty of whipped cream, a citrusy orange curd topped with crunchy shortbread crumbs and hazelnut praline. Meanwhile, the roasted chocolate flourless cake on the side is rich and slightly bitter with moist chocolate cake on top. The dessert went really well their signature cocktail, the Furlough ($14). Essentially a digestif, the mixture of bitters and syrup helps to settle the stomach after the lovely meal. 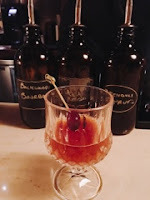 Unlike the earlier cocktails, this has a stronger bourbon base infused with a tobacco essence (sounds strange but actually works). It’s all lightened with patchouli syrup, cacao bitter and sweet vermouth; the finishing touch lighting the drink on fire with a spritz of atomized essence of cigar. In the end, the drink provides the smell of tobacco but tastes of cacao and an almost vanilla essence. You’ll have a difficult time deciding where to sit: the bar (where all the action is) or the patio in the back (so tranquil and airy). 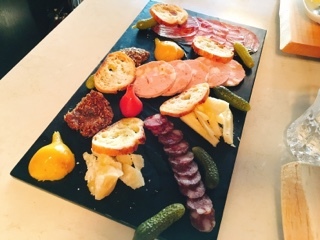 Of course, you can always follow our lead and start with cocktails and nibbles at the bar and move into the patio for the main meal. 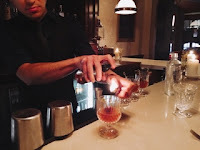 Additionally, if $14 cocktails aren’t in your budget, consider visiting on Tuesday when the bartender on duty invents an innovative special for the evening for only $10. Of course, there’s also the aforementioned $18 cocktail tasting flights offered on Wednesday that gives you three half-cocktails. Combine these drink specials with their $35 3-couse prix fixe meal (that offers the fantastic fried chicken as one of the mains) and you’ll have an affordable meal. Going on a furlough is essentially taking a leave of absence from work. At a time when the economy is a little shaky and work can be somewhat stressful, we could all use a break from the “real life”. 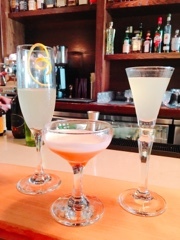 The attitude at Furlough is relaxed and care free - expertly made cocktails and food without the snobbery. Dinner at the restaurant was lovely: its easy tasting drinks and secluded patio surely allowed me to leave my worries behind.